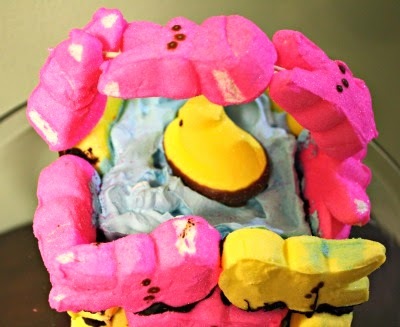 **Disclosure: We receive complimentary PEEPS in order to create a fun craft. No compensation was received. All opinions are 100% our own. Easter is a time to celebrate family. 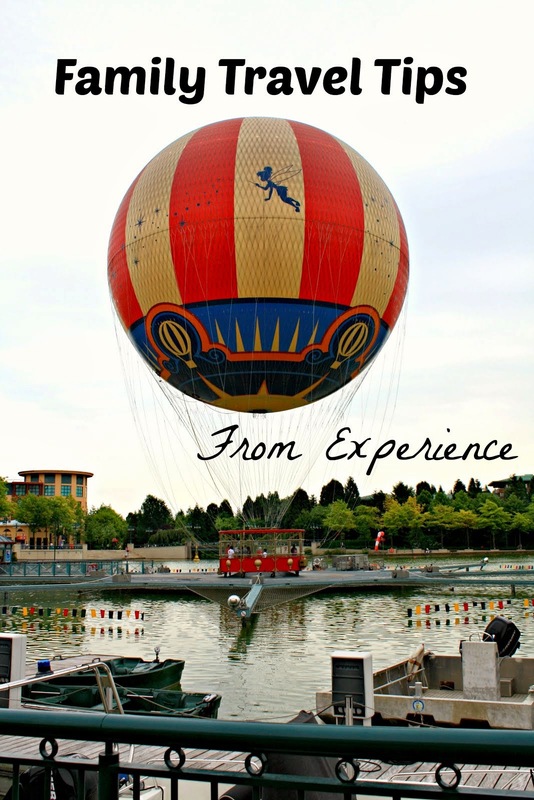 From visiting the bunny to egg hunts to baskets on Easter morning, there a lot of delightful family memories this time of year! My daughter and I love to work on creative projects together so a project with a little Easter inspiration was in order. PEEPS provided the perfect inspiration for our project. After brainstorming for a bit, we came up with a perfectly spring basket to serve as a "pool" for one of our PEEPS chicks. 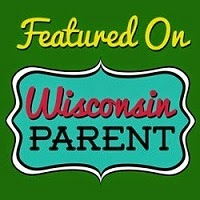 It was a fun project and one that kids can really help with. PEEPS are really easy to work with and make crafting fun! We made our project as edible as possible with the exception of a few toothpicks. For our project we used to large packs of PEEPS, chocolate chips, whipped cream, blue food coloring and a chocolate dipped chick. To begin, we assembled our basket. 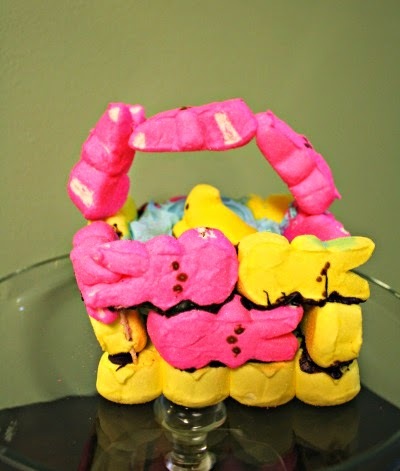 To do this, we melted the chocolate chips and used the chocolate to attach our PEEPS together to make our basket. Once our basket was assembled, we let it dry before adding our water. Originally, we put our handle on before adding the water but we should have put that on last because it was a bit in the way during the next steps. 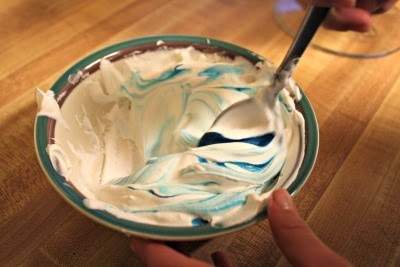 Once our basket was dry, we mixed our whipped cream to the desired blue. Then, we filled our basket with our "water". Next, we topped our water with a chocolate dipped chick. 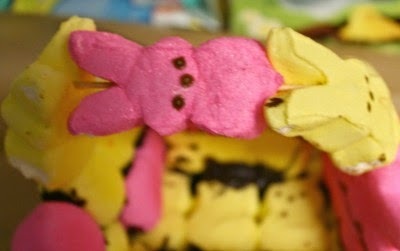 We used toothpicks to attach three PEEPS together and then to the basket as a handle. 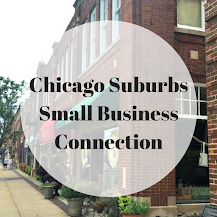 A pretty easy project and we had fun creating it! 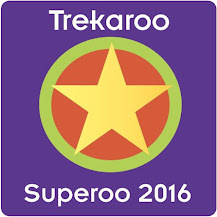 Since it is edible, the kids will enjoy this treat. You can even add some berries to dip in the whipped cream. 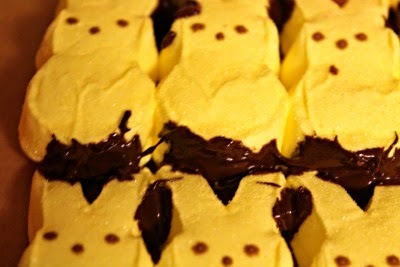 PEEPS are a lot of fun to work with--and easy. Are you working on any PEEPS projects this Easter?